1972 Mercury Capri - Yesterday I posted a Merkur XR4Ti. The Capri was an earlier attempt by Ford to sell one of it's European cars in North America. Built in Germany and sold throughout most of the world as the Ford Capri, it was badged as a Mercury in the US. It was successful. At one point it was the second best selling European import, behind Volkswagen. It is a very fun car to drive. This Capri has been restored. It now wears a Ford badge like the European cars do, and it has the GT striping. Personally, I'd hold out for a V6 Capri, but if you don't mind the 4, this Capri is worth looking at. 1981 Isuzu I-Mark - After GM (mercifully) stopped selling this car as the "Buick Opel By Isuzu," Isuzu rebadged it as the I-Mark and started selling it themselves. It was comfortable and well appointed when compared to many of the other small Japanese economy cars of the day. The diesel engine was never offered in the Buick Opel version. The diesel makes the car painfully slow. 0-60 will take 20 seconds or more. There are very few of these cars left in North America. Most succumbed to rust. The rest of them succumbed to lack of interest. This car is in overall good shape for its age. This is not an exciting car, but it's a piece of automotive history. Isuzus have a small, but loyal following in the US and I'm sure this car will find an appreciative home. Located in Duarte, CA, click here to see the eBay listing. 1969 Austin America (From Hell) - So, you're like me and you love the Austin America. (That puts us in a very small subset of car geeks, by the way. ;-) ) But you're concerned that the 60 horsepower the 1275cc engine produces won't be enough to keep you happy. I have good news for you... 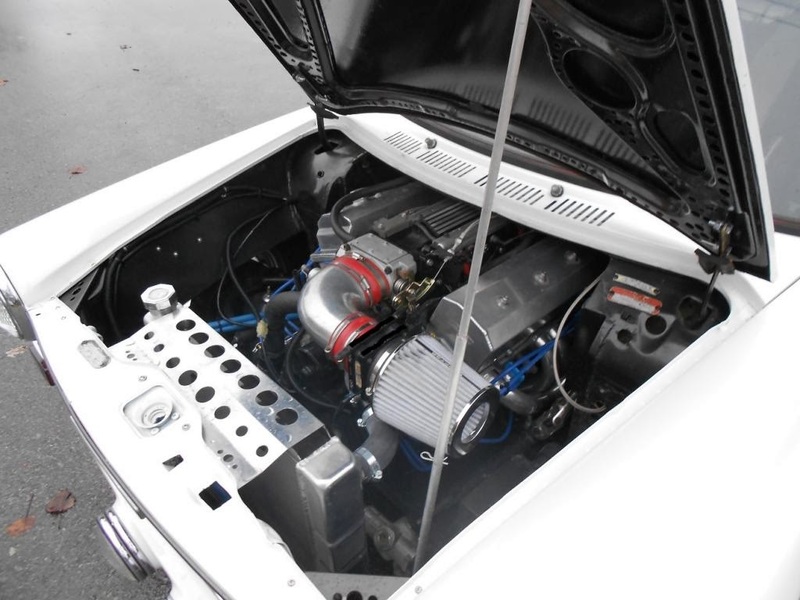 This car is for sale and it has an engine that produces 10 times that amount. 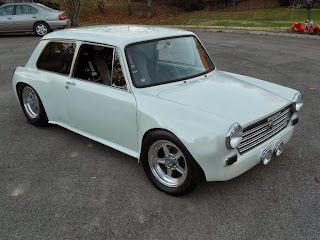 This Austin now has a 600 HP LT1 engine in it. In case you were wondering - and I was - the seller says it is street legal. I'm not a big fan of hot rods, but this is really cool... Just because it's based on an Austin America. I had an I-mark diesel I bought after I crashed my previously mentioned Chevette, mine was a 4door with a stick and wasn't unbearably slow (it wasn't a rocket by any means) Mine got 48mpg when Diesel fuel was 90 cents no matter where or how I drove it, a round trip to the beach which was over a 100 miles for me cost $2 ; it'd be great to have another one. Re: the Capri - did they really come with that huge hood bulge?? This one seems a little over done. Also, a shame they couldn't finish painting the wheels with the black trim.